(Post made at 2110 on 24 Dec 2017 in a personal capacity. Please see here for important background and disclosure of interests). I must confess to ignorance here: I knew about virtuoso percussionist Dame Evelyn Glennie, but before reading a recent article in the National Deaf Children’s Society (NDCS) magazine, I did not know that deaf people could play the violin. The NDCS has a “Get Deaf Aware” poster (the link should download a copy to your device) that includes as one of its phrases “Even though I’m deaf, it doesn’t mean I can’t play the violin!”. 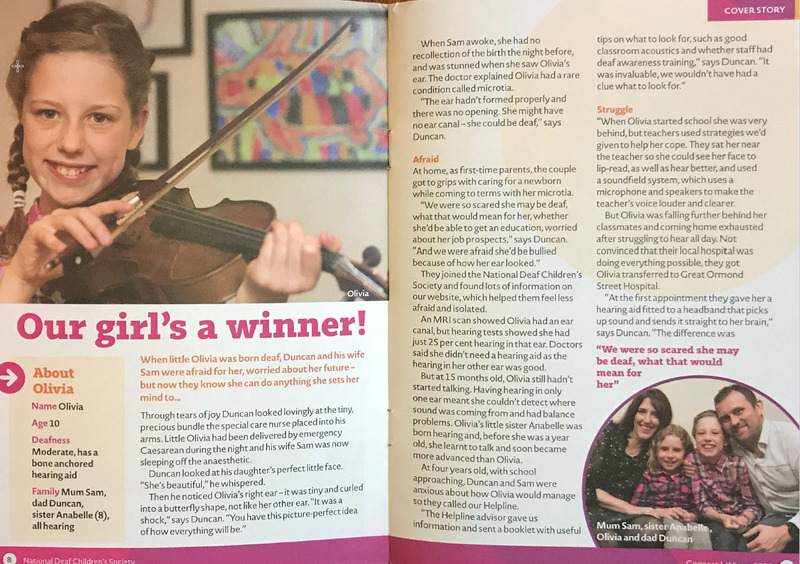 There is a touching (but also troubling) article in their magazine about a girl with moderate deafness who has been playing the violin and has really been enjoying it. “This summer Olivia, who’s been playing the violin since she was seven years old, won our Raising the Bar competition. Her prize was to spend a weekend playing in an orchestra with professional musicians who are deaf, which gave her another confidence boost”. I don’t know whether Olivia lives within reach of the Centre for Wessex Young Musicians (CWYM), but if she (or any other deaf child who wanted to play an instrument) does, I would really hope that she would be accepted and offered every opportunity to take part to the maximum extent possible in CWYM activities. I hope she is able to find a similar local ensemble and youth orchestra that will help her continue to enjoy her music and grow in confidence, and I will be contacting the NCDS to pass on my suggestion to Olivia’s parents that they make enquiries for suitable organisations in their local area. (I am measuring my words very carefully in what follows due to legal threats received). Sadly, one of several concerns which I raised earlier this year (and which in my view was ignored by the “independent” investigation of what turned into a formal complaint to Bournemouth and Poole College after informal attempts had also in my opinion been ignored) relates to this issue. In my opinion (and I believe that of others too, but as SWYM Chairman I took the responsibility of speaking out about it), the Bournemouth and Poole College did not treat a child (like Olivia, but with different extra needs) as well as they should have done. Olivia’s confidence was boosted by being able to play with an orchestra. I’m afraid that the opposite seems to have happened in the case that I mention. (I also saw this happening with a second child. I didn’t include this in my formal complaint because I believed the mistakes made in the first case were obvious enough to show the need for improvements in treatment for children with extra needs. Perhaps I was wrong not to mention it, in which case I apologise to the child and family concerned). If you wish to support children like Olivia, please do consider donating to the National Deaf Children’s Society, and if you come across situations where you think children who need a bit of extra help should be able to take part in activities, please do support them and their parents by speaking out in their favour. It might make a major difference in their lives. Previous Post No Bournemouth and Poole College Board minutes published for the last 6 months? Next Post Best wishes for a musical and Merry Christmas and Happy New Year! I heard from the National Deaf Children's Society today, they thanked me for my suggestion and are going to pass it on to Olivia's parents.